It’s election time so welcome to the party the Nottingham Playhouse hit Tony’s Last Tape which is playing a limited run at London’s newest fringe theatre, Bridge House Theatre SE20, from April 27. Based on the famous political diaries of Tony Benn, one of Britain’s most respected, celebrated and controversial politicians, Andy Barrett’s Tony’s Last Tape examines the struggle of a man who realises that maybe it is time to withdraw from the fight, to let others take over, but just doesn’t quite know how. 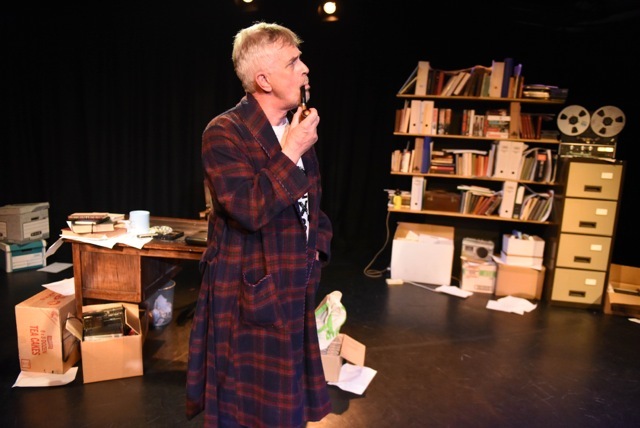 Tony’s Last Tape, starring Philip Bretherton as Tony Benn, was a sold-out smash when it premiered at Nottingham Playhouse last month, directed by the venue’s artistic director, Giles Croft. It is now getting a swift London transfer to South London where it runs from April 27-May 17. Giles Croft said: “Tony’s Last Tape sold out very quickly in Nottingham, which shows the affection that continues to exist for Tony Benn. “Once it opened the clamour for tickets increased because Andy’s play is funny, touching and passionate and is brilliantly performed by Philip Bretherton. Rob Harris, lead producer at the Bridge House Theatre added: “Our artistic director, Guy Retallack and I are immensely proud to have secured the London Premiere of Tony’s Last Tape. “Tony’s Last Tape illustrates the quality of the work we wish to be known for at the Bridge House. “The show excels in all areas from the writing, to the direction and has a charismatic performance from Philip Bretherton, who plays one of the most influential and characterful politicians of our times”.